Growing up in a small town, I never expected to have the opportunity to be back where I grew up. Even when I was still in high school and in the area, no one had heard of Winfield, Missouri let alone could tell you where it is or how to get there. However, after moving during the fall semester, I did a lot of research to find a school that would be closer for me, either close to my house or on my route home and found an awesome opportunity. 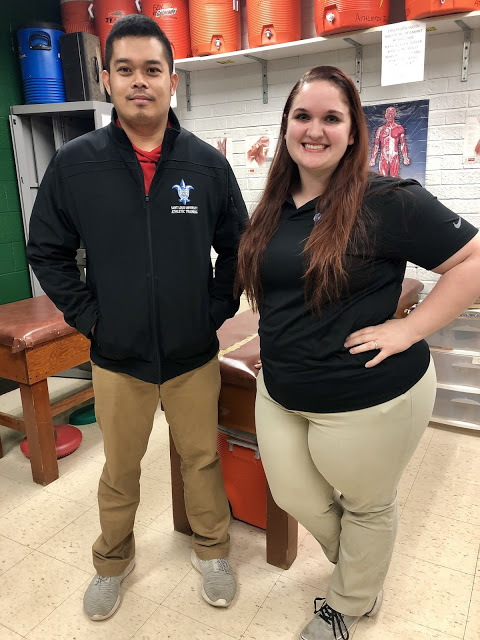 I was placed at Fort Zumwalt North High School, with preceptor and SLU AT alumni Jay Maturan MAT ATC. I have known several students who have graduated from FZN, several previous teachers who have began teaching there, as well as competing against FZN during my time in high school. Although it is not the high school that I attended, it is definitely one that I feel very connected to and have really enjoyed the opportunity to be “back home” and learning from a SLU graduate. 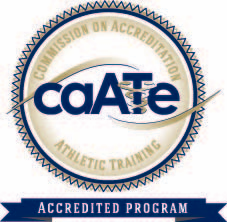 I have focused this semester on improving my confidence in my skills and interactions with athletes. Although I like to consider myself a “people person,” patient interaction is about much more than just being able to talk and get to know our athletes. Joking around and having conversations with the athletes is not the hard part. Being confident in what we do, without being cocky or over confident in our craft is essential. If we are not confident then the athletes will not trust us to treat them and provide care, possibly leading to worse injuries because they avoid being looked at when needed. Jay is very professional, yet has an incredible relationship with his athletes. This is something that I truly admire about him and am able to learn from my time with him. He is respectful of each student’s privacy and comfort level, while also making sure he doesn’t cut corners or miss anything. He has built that trust with the athletes, even in his short time with them, that they feel comfortable coming to see him and trust that he knows what he is saying. Every time an athlete comes into the Athletic Training room, Jay has trusted me to have the initial opportunity to observe and evaluate their illness or injury. Having this constant practice has really helped to improve and fine tune my evaluation skills and process. I have done many more evaluations in just the first month and a half than I have done previously and it has been awesome to see my improvement thus far. I am getting so used to it that I find myself evaluating and beginning to ask history questions whenever my family or friends will talk about something hurting or bothering them. It is becoming a habit, which I know means that my confidence is already improved since I first started my clinical rotation with Jay. The moment I have been most proud so far this semester is evaluating an athlete and determining that she may have a stress fracture in her foot. After referring her to a doctor, she returned to school with a boot and a diagnosis of a stress fracture. Even though this is not unusual, it still felt good to have a confirmation in my process and evaluation skills.